TCP-Wedge can operate as a TCP/IP Client or as a TCP/IP server. If you choose the option to set up TCP-Wedge as a TCP/IP Client, then you will need to enter the IP address ("Remote Host IP Address") and the Port number ("Remote Port") of the TCP/IP Server that you want TCP-Wedge to connect to. When you set up TCP-Wedge as the client, TCP-Wedge will be responsible for establishing the connection to the Remote IP Address and Port number that you specify. The connection to the remote IP Address will occur when you activate TCP-Wedge by selecting either "Test Mode" or "Normal Mode" from the ACTIVATE menu or when you open the "Analyze" window by selecting "Analyze" from the PORT menu. If you choose to set up TCP-Wedge as a TCP Server, then TCP-Wedge will use the IP address of the computer that you are using as the "Local IP Address" however you will need to specify a "Local Port" number that you would like to use. In this case, the remote client will be responsible for initiating the connection to TCP-Wedge using the Local IP address for your PC and the Local Port number that you specify. 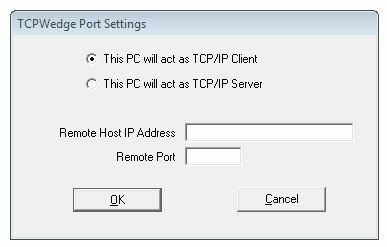 When you select the option "This PC Will Act as TCP Server" in the TCP Wedge Port Settings dialog box, the Local IP Address for your computer will be displayed in gray text in IP Address text box. If your PC does not have the TCP/IP network protocol installed or if your PC does not have an IP Address assigned to it, you will not be able to select the option to set up TCP-Wedge as a TCP Server. If you set up TCP-Wedge as a TCP Server, after you activate TCP-Wedge in either Test or Normal mode, it will simply wait for another computer on the network to establish a TCP/IP connection to it using the Local IP Address of the PC where TCP-Wedge is running and the Port Number that you specified. TCP-Wedge is functionally identical to the WinWedge except for a few minor differences. Since TCP-Wedge does not communicate over a serial port you will not be able to select any options that are specific to a serial port. For example, when you define serial output strings or hot keys and hot key actions in TCP-Wedge you will not find any options or hot key actions that relate specifically to serial ports. This includes the ability to set the states of any serial port hardware handshaking lines like RTS and DTR. Otherwise, TCP-Wedge is identical to WinWedge. There are a number interesting ways that you could use TCP-Wedge including sending and receiving data over an Intranet or the Internet directly from within any Windows program like Excel or Access. Several network hardware companies also sell protocol converters that convert from RS232 to an Ethernet connection. Using one of these devices, you could connect an instrument with an RS232 output directly to a TCP/IP network. You could then run TCP-Wedge in any PC on the network to communicate with the serial device. Using an RS232 to TCP/IP converter, you would not need to install a complete networked PC at the location where the device is at. You could simply install a network connection and the RS232 to TCP/IP converter and then use TCP-Wedge on any other PC in the network to communicate with the device. One company that makes a good RS232 to Ethernet converter for around $500 (model# MSS1) is Lantronix , Tel: 714-453-3990 (http://www.lantronix.com). If you have a PC with a network connection near your RS232 devices you can use TAL’s new TCP-Com software to convert the RS232 to TCP/IP (or TCP/IP to RS232).